Khao Lak Dive Sites – The local Khao Lak Diving highlights are the Wrecks of the coast of Khao Lak & Thai Muang. This is one of the newer wrecks in Thailand having sunk in August of 2009 a few Kilometres off the coast of Thailand close to Thap Lamu/Khao Lak. This Boat, the MV Sea Chart 1, was a Thai built and registered bulk carrier cargo ship which was transporting a load of 1200 Burmese Iron wood Teak logs from Burma to Vietnam. This wood is also known as illegal teak as there is a UNESCO ban on the harvesting and trading of this wood. The boat met unexpected rough weather as it skirted the coast of Thailand, started taking on water and sank. All the crew survived on inflatable life rafts and were rescued by the Thai Navy. The rumour is that the owner wanted to salvage the cargo but the Thai Navy claimed they had salvage rights and the two parties are now fighting it out in court. For now, however, the cargo is intact and more and more companies are starting to dive this site. The boat lies on it’s starboard side in 40 metres of water on bare sand. The shallowest point on the wreck is the port side hull at between 22 and 24 metres. Being quite new the reis not much coral growth but the wreck is already teeming with life, on the wreck itself there are many Lion Fish, Puffer Fish and Bat Fish, the exposed hull is covered in Sea Urchins and schoals of Snapper, Fussilier, Trevally, Tuna and Barracuda are drifting around the wreck and a group of Rainbow Runners are often found hanging out close to the mooring line. There are opportunities for some simple penetration into the wheel house and cargo hold. The Boonsung was a tin dredger barge operating along the coast of Thailand, She sank in 1984 through bad weather or bad maintenance and sank intact to the sea bed at 18 metres and there she sat until boxing day 2004 when the Tsunami rolled through and ripped her open. This is very much a tail of two dives. 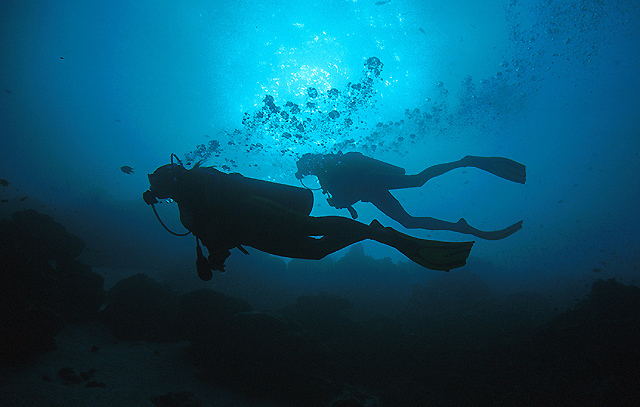 Day dives and night dives are dramatically different on this site. During the day it’s fish soup, huge schoals of Snapper, Fussilier, Blue Fin Travally and Juvenile Barracuda completely fill the sight often making in quite hard to make out the wreck itself. Once the night sets in these fish drift away from the wreck making room for huge numbers of Lion Fish, Scorpion Fish and Porcupine Puffer Fish. You also get the opportunities to spot some of the macro life on the wreck itself, nudibranchs, Frog Fish, Decorator Crabs and Hermit Crabs. This wreck is also home to a number of Honeycomb Morays. This wreck close to Thap lamu and Naiyak Beach is also known by many other names such as “Premchai”, “Codreco” and “Thai Muang Wreck”. This boat was a tin dredger which sank in august of 2001, she sank such that her hull isuppermost at an angle of about 60˚ in 21 metres of water, some debris fell off the deck and is scattered around the main hull. There is some coarl growth here but it is best known for hugenumbers of fish and an amazing variety of Nudibranchs.